외사리 마을의 산기슭에 있었던 탑으로, 일제시대에 일본인에 의하여 해외로 반출될 뻔 하였던 것을 간송미술관에 옮겨 세워 놓았다. 한국전쟁 때 탑이 무너져 각 부분이 흩어졌으나, 1964년 다시 세워 원래의 모습을 되찾게 된 것으로, 기단(基壇)과 탑신(塔身)의 각 부분이 8각으로 이루어진 일반적인 모습이다. 기단은 아래받침돌이 상·하 2돌인데, 아래에는 안상(眼象)을 새기고, 위에는 연꽃무늬를 돌린 후 8각마다 꽃조각을 돌출시켰다. 가운데받침돌은 아래에 구름모양을 돋을새김하였고, 그 위는 각 면이 위는 좁고 아래는 넓은 배흘림을 하고 있어 특이하다. 탑신은 몸돌이 가운데받침처럼 배흘림을 하고 있고, 남북면에는 문짝모양의 조각이 있는데, 그 안에 자물쇠가 돋을새김되어 있다. 지붕돌은 처마가 높아졌고, 각 귀퉁이마다 지나치게 커보이는 꽃장식이 솟아있다. 꼭대기에는 중간에 두 줄의 선을 돌린 둥근돌 위에 이와 비슷한 모양의 장식이 두 개 더 얹혀져 머리장식을 하고 있다. 웅장한 모습이나 각 부에 새긴 조각의 양식으로 보아 고려 중기 이전의 작품으로 짐작된다. This stupa at the foot of a mountain in the village of Oesa-ri was almost smuggled out of the country during the colonial period. 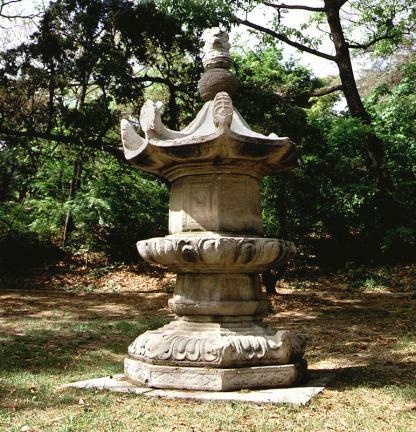 The rescued stupa was, then, given a new home at the Gansong Art Museum. Later, during the Korean War, it collapsed, with its elements lying scattered. In 1964, it was re-assembled and re-erected and recovered its original appearance. 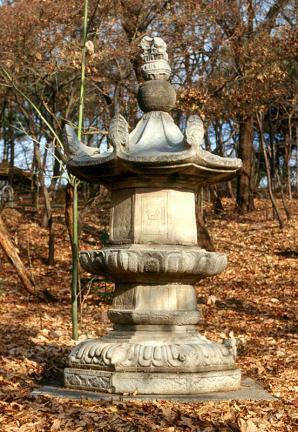 This typical stone stupa is octagonally-shaped both at its base and body, as is frequently the case with monuments of its type. The lower base consists of two tiers. 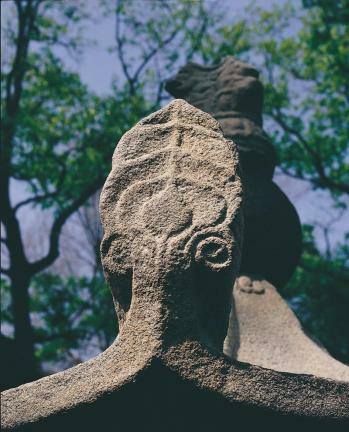 The bottom tier has a row of the so-called ansang (elephant’s eyes) pattern – a horizontally-long ellipse with wavy edges on its lateral sides-. A row of lotus flowers is placed above, and floral motifs jut out from each of the eight corners. The middle mounting is decorated with clouds in embossed carving. Each of its sides is wider at the bottom and narrow at the top, a feature rather rarely seen in this type of structure. The body of the stupa also has lateral sides that taper off toward the top like the sides of the middle mounting. The north and south-facing sides bear a surface design that resembles a door with a lock in the middle, in embossed carving. The eaves of the roof are turned sharply up at the edge, and oversized floral decorations stand prominently at each corner of the eaves. 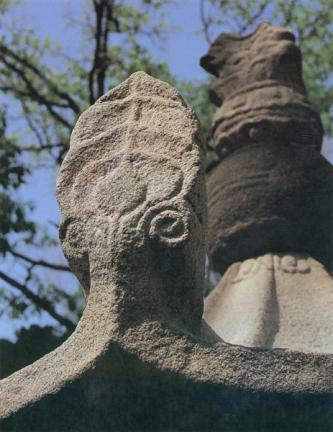 There are two more such oversized decorations at the finial of the stupa, mounted on a spherical stone ringed by two lines. 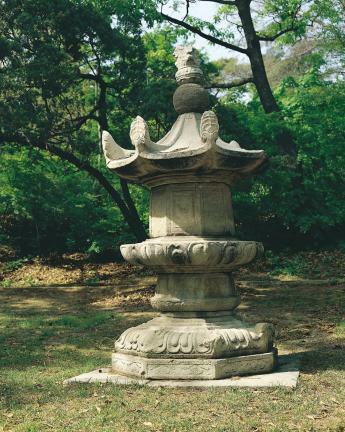 This stupa with a majestic appearance is dated to sometime before mid-Goryeo, judging from its sculptural details.